By examining how narrative strategies reinforce or contest deterministic paradigms, this work describes modern Chinese fiction’s unique contribution to ethical and literary debates over the possibility for meaningful moral action. How does Chinese fiction express the desire for freedom as well as fears of attendant responsibilities and abuses? How does it depict struggles for and against freedom? How do the texts allow for or deny the possibility of freedom and agency? By analyzing discourses of agency and fatalism and the ethical import of narrative structures, the author explores how representations of determinism and moral responsibility changed over the twentieth century. 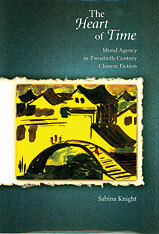 She links these changes to representations of time and to enduring commitments to human-heartedness and social justice. Although Chinese fiction may contain some of the most disconsolate pages in the twentieth century’s long literature of disenchantment, it also bespeaks, Knight argues, a passion for freedom and moral responsibility. Responding to ongoing conflicts between the claims of modernity and the resources of past traditions, these stories and novels are often dominated by challenges to human agency. Yet read with sensitivity to traditional Chinese conceptions of moral experience, their testimony to both the promises of freedom and the failure of such promises opens new perspectives on moral agency.